I've tried quite a few recipes for standing rib roasts...and they were all pretty good, but this one is so far superior and actually easier too! Once I made a paste of herbs and salt and pepper and rubbed it on the roast. It looked spectacular but as soon as you sliced the meat it fell off. And then the au jus was way too salty to use. Just recently I opened up the November/December issue of "Cooks Illustrated" and there was a recipe for the best prime rib. Just in time for our family Thanksgiving dinner. So I gave it a try and it received rave reviews from everyone. When buying your roast prime grade is best but sometimes my market does not have prime, so next best would be choice grade. Have the butcher slice the bones off and then tie then on in place again on the roast. At home salt the roast and then refrigerate it uncovered for a least one day or up to 96 hours. 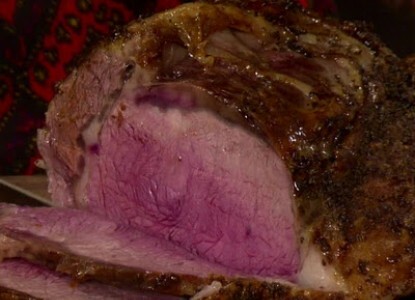 Then on the day you are to serve the roast take it out of the refrigerator and allow it to come to room temperature. Preheat oven to 200 degrees. Heat oil in a large skillet over high heat until almost smoking. Sear the roast on top and bottom and sides until browned. Let the roast cool for 10 minutes. Transfer roast, fat side up to wire rack set in a rimmed baking sheet and season with pepper. Roast until a instant read thermometer reads 110 degrees, about 3 to 4 hours. Remove the roast from the oven and let and tent with foil and let rest for about 30minutes. Next adjust the oven rack so it is about 8 inches from the broiler. Remove the foil over the roast and ball it up, and place it under the ribs to lift the the fatty part. Broil the roast until the top is well browned and crisp, 2 to 8 minutes. Remove the roast to a carving board, then cut the twine that is holding the bones on and remove them...save for great beef broth. Slice the meat to your desired thickness and serve with a little au jus from the drippings. The meat will be incredibly tender and beautifully pink. Believe me your house will be smelling fabulous by this time!